Dance Therapy prepares you to step into the “Dance of Life”. Dance therapy is not about achieving defined forms of dance, but is concern with genuine, creative movement. The objective is to re-establish the unity of body, mind and soul. The increasing tendency towards isolation and growing estrangement in our society often results in emotional, mental and physical illness. Dance therapy helps people to rediscover themselves, thus achieving greater self -awareness and a sense of well-being. People can find their true inner self throu authentic movement. They learn to love themselves and thus learn to love other. Dance therapy can be applied to all form of psychic and psychosomatic disorders. Through our own experience in movement and dance we are not on! Touched physically but also emotionally, mentally and spiritually. The human being makes contact with the conscious and unconscious parts of his personali learn to accept them and to assimilate his experiences based on his personal history. Accompanying talks are of equal importance. 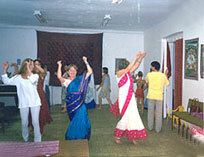 Kala Ashram shows the various forms of application of the ancient healing power of the dance, the roots of dance therapy – dance scenes from the native American Indians, From African and Oriental dance and the various form of folk dances found in the different cultures throughout the world. We see how children have no trouble in expressing their emotions. In comparison to this it becomes apparent that many adults are no longer capable of responding direct to their inner impulses. They lost their sense of self. It becomes very impressir to see how dance therapy accompanies people in healing deep emotional wour experienced during childhood. Kala Ashram shows this process-oriented work people deeply engaged in their own personal processes. A developmental dance clearly illustrates it during which life phases emotional blockages can occur are how the healing power of the dance together with the human relationship can solve them. Through this primal trust can grow or be reinforced. The core of Kala Ashram’s work is the development of our capacity to love and build up relationships – the feeling of belonging to joyful community. How these prerequisites are formed is made very clear through special dances with emphases on different developmental stages. In this sense dance therapy prepares you to step into the Dance of Life. 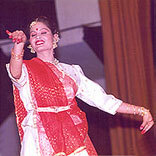 Kala Ashram conducts regular classes for Dance Therapy & Classical Dance Kathak. Diploma / Degree Courses are been conducted for job orientation. It varies from one year to eight year. Crash Courses on classical vocal, classical & folk dance and classical instruments are also been conducted.